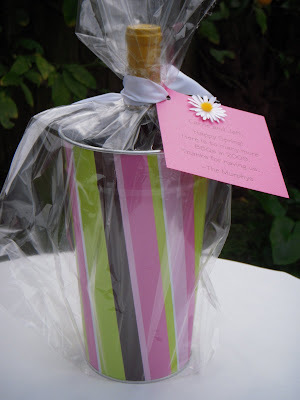 Jac o' lyn Murphy: Run don't walk to Target...Great Hostess Gift Packaging! Run don't walk to Target...Great Hostess Gift Packaging! 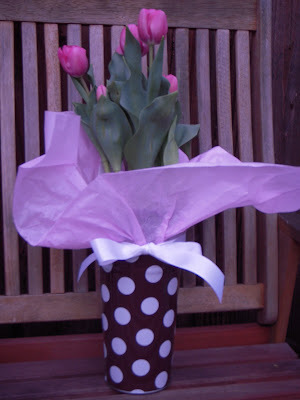 I love the color brown so as I was beelining to the wrapping paper in my local Target these cute brown and white polka dot metal buckets caught my eye. I knew instantly they would be perfect for wine (which is the intended purpose, it is called the Vino Caddy), flowers, soaps, homemade cookies or almost any small gift. The BEST part is that they are 90% off the orginial price...the orange sale sticker read $2.24, most gift bags are a least that much! Look for them on the endcap of the aisles near the gift bags, cards and candles. On my way home from Target I realized I will have to go back tomorrow...teacher's end of the year gifts are right around the corner. How cute!!!! I bet your friend Stephanie wishes she were going to get something THAT cute!